Your cousin Leo is getting married! But when you get to Leo's castle, you realize your happy reunion will have to wait a while – a horrible Beast has attacked the castle and now controls everyone within its walls. Luckily, you were running late and are not affected by the Beast's curse. Team up with a mysterious hunter to break into the castle and save everyone before the guest list becomes lunch! 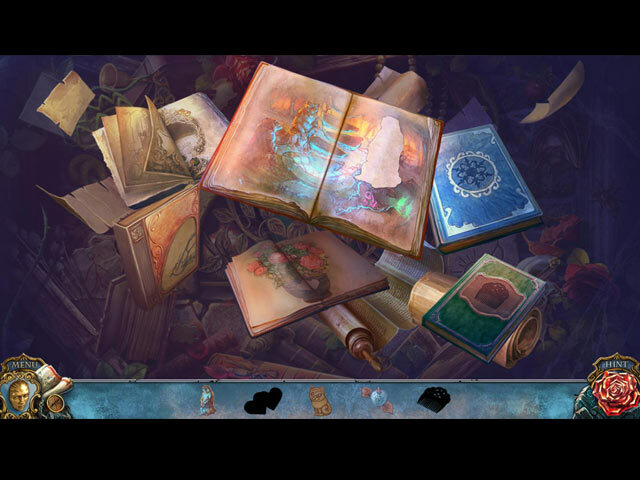 Just be careful – even everyday objects are working against you in this magical hidden-object puzzle adventure game! Living Legends: Uninvited Guests is rated 4.5 out of 5 by 16. Rated 5 out of 5 by rpggramma from Very Good Game! Interesting story. Info, journal, and map are very good. HOs are good, and puzzles are different, challenging. There is a map puzzle here that I had never seen before and it was very challenging!! It was great and I would love to see more like that!!!! This one is really fun, loved it!! Rated 5 out of 5 by katnap123 from A nice twist to a familiar tale I go by reviews and try to only pick the best games to purchase, and according to the reviews, I knew this was going to be a good one right out the gate. The puzzles are on the easy side. They may not be challenging enough for some. However, they're varied and unique, and I enjoyed them. The storyline and beautiful graphics totally swept me up, making me wish I had gotten the CE instead. Glad to see that the Living Legends series is keeping up with the high level of graphics and story development that I enjoy. Rated 5 out of 5 by worlockslady1 from Great game. Glad I Played It. I finished the game. Oh what a great love story. It really draws you in. Fun puzzles, some maybe a bit easy but all of them were fun. I will be playing this game again. It is totally worth the cost. Rated 5 out of 5 by Alenee from Excellent I'm gonna chime in with all the other reviewers who gave this game a high rating & recommendation. It has everything I expect in such a game: tasks that relate to the game, including HO scenes; beautiful and original graphics (especially the skylines, wow! Very realistic & haunting); a bit of a unique quirk in the style and the story; multiple locations, so you're not just running around a castle or forest the whole time; and a reasonable amount of whodunnit suspense. The only downside, which is kind of minor, is that the devs clearly cheaped out in a couple of places. The voiceover in one character was very tinny and awful quality. The screen cannot be changed from full to windowed without restarting the game. These kinds of details I'd expect to find ironed out in 2018 but I don't hold it against them as they don't significantly dent my enjoyment of the game. Well done! Rated 5 out of 5 by ninja226 from Fantastic love story This appears to be a companion sequel to The Beasts of Bremen, but takes off in a completely new and unexpected direction. The story is told well, without making me fall asleep or get distracted. Animation and special effects are well done. It's mainly a fairy tale with lots of creative touches. Gameplay is excellent, and you can play on Expert mode and still get Hint, Skip, and helpful messages. Most puzzles are easy and manageable, except the last one, which I didn't understand at all. This is a thoroughly enjoyable game with engaging story that will make the hours melt away quickly. Rated 5 out of 5 by Talisbird from Thrilling romantic story A really beautiful, well made, satisfying game. I am so glad I got the collector's edition too. The extras are great and include screen savers as well as the enjoyable things that we are expect from an attentive developer. Mini games and HOP's are attractive and interesting. The graphics are very good and atmospheric and there are some really fine animations. The musical score is haunting. The story is dramatic and touching. I felt truly involved. I think I will play this through again some time. Rated 5 out of 5 by biscuitsmama from A BEAUTIFUL ROMANTIC/FANTASY GAME In another spin on the Beauty and the Beast theme comes Living Legends 6: Uninvited Guest. I am very fond of the Living Legends series and found the last game just as excellent as the first. This newest offering so far holds up to that same standard. Also I am an incurable romantic at heart and so I love this particular game. You play the game as Kate who hasn’t seen your cousin Leo since childhood. You have received an invitation to his wedding and it presents a wonderful chance to renew your childhood friendship so you undertake the journey to his castle. Of course being a HOPA game your trip is beset by little things that inevitably make you late, which in this case is good. As you arrive for the wedding the gate to the castle is blocked and you find out that something horrible has befallen the castle and now you must use your wits to save your cousin Leo. I find only one technical issue in the game and it is something that also occurred in another game by this same developer – Immortal Love the Price of a Miracle. There is a quick, bright flash that seems to occur when there is a transition within the same scene such as entering the tent in this one. I only mention it because it is a bit annoying. That being said, the graphics are gorgeous as they create a fantasy world. Although the castle has been besieged and is damaged at least the scenes are not dreary brown and black. The artists have still used a great deal of color in creating Leo’s castle. Your tools include an interactive map that allows quick travel between scenes and locations. You also have a Magic Mirror but of course some might think of it as a gimmick because you will periodically need to find Soul Stones to feed it to receive its help. The game has 5 chapters plus the bonus chapter and I am finding each chapter longer than normal. There is a lot to do and a lot of things to discover. Of course looking for those collectibles and morphs are keeping me busy and slowing me down a bit. The HOPS are nothing new but I still like them because most are the list type that to this day remains my favorite type of HOPS. The scenes in this game are very lovely with some touches of creativity and a bit of interaction. Thankfully, they are not all so interactive that I want to rip my eyelashes off. 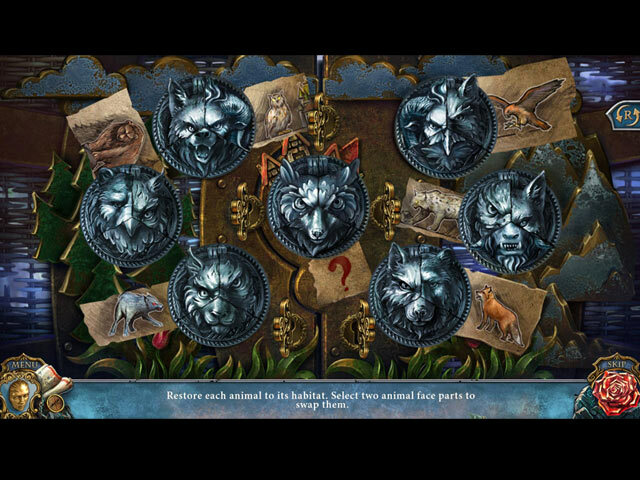 The puzzles are not difficult and I am enjoying each one that I come across. Sometimes having puzzles that don’t fry my brain is a good thing. There are times when I really enjoy the challenge of some more difficult puzzles but the nature of this game seems more fitting for easier puzzles. As is always the case, I have no doubt that there will be one or two more difficult puzzles later in the game but for now I am happy. Not everyone likes easy or slightly challenging puzzles but many gamers who dislike puzzles will most likely enjoy this game. The CE version of the game includes all of the extras I would want in a CE with 68 collectible owls and 34 morphing objects to find. Some of the collectibles are easy to spot but others are well-concealed and it takes a bit of hunting to find them. For those of you who are interested there are achievements to earn as well. The other extras include the standards such as Wallpapers, Concept Art, Screen Savers, Movies, Music a Bonus Chapter and the Strategy Guide. This developer has also included the ability to replay Mini-games and HOPS, which is something that not all developers include so, IMHO, this is a great CE package. 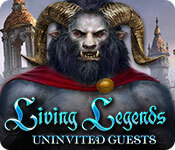 Living Legends 6 Uninvited Guest is a beautiful game and I have been enjoying each moment that I have played. I highly recommend this game if you want an excellent fantasy/romantic type game to play. There have been some times where I didn’t know what to do but that was because I wasn’t looking everywhere and even checking back into my inventory. So if you decide this game is for you don’t leave any stone unturned or book unopened as the case may be. As always, I recommend that you try the demo to see if this will be a game you enjoy. Happy gaming!! Rated 5 out of 5 by rolfes from This is a truly beautiful game What a lovely experience it was to play this game. From the first scene to bonus chapter it did not disappoint. Beautiful illustrations, creating some scenes so interesting, that I didn't want to leave them. 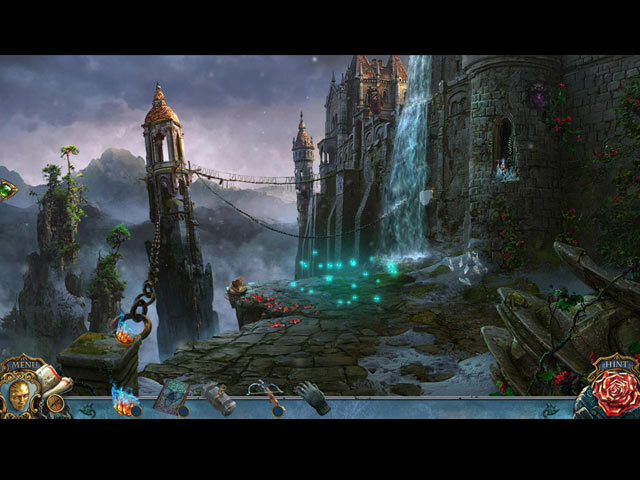 Interesting puzzles, easy to navigate and know if you have found bonus items. Engaging, even engrossing but all-in-all just a beautiful ride. Rated 5 out of 5 by lamp_post from EXCELLENT GAME!! What a beautiful love story this is! 4 Friends is at the top of my list for great devs. The story live keeps you so engrossed that you almost forget to look for the morphing objects and owls. The graphics are tremendous as are (to me) every aspect of this game. The mini games are fun and not too challenging but challenging enough to keep you thinking. I have already played the entire game, and I am going to replay it......that is how much I have liked this game. Try this one. It is a KEEPER.